Each month, StarSpace46 shines a spotlight on members who are making a difference in the community. Representing a wide variety of businesses and backgrounds, each member has a unique story to tell. If you are interested in sharing your experience at SS46, send your story to info@starspace46.com. This month's we share the story of Viktoria Carlson, a member since 2016. While it may seem like hyperbole when you read about an organization who claims to bring together industry leaders from “all over the world,” at StarSpace46, that is most certainly true. Viktoria Carlson, currently the Business Operations Director for Hoegg Software, spent most of her childhood in Sweden. 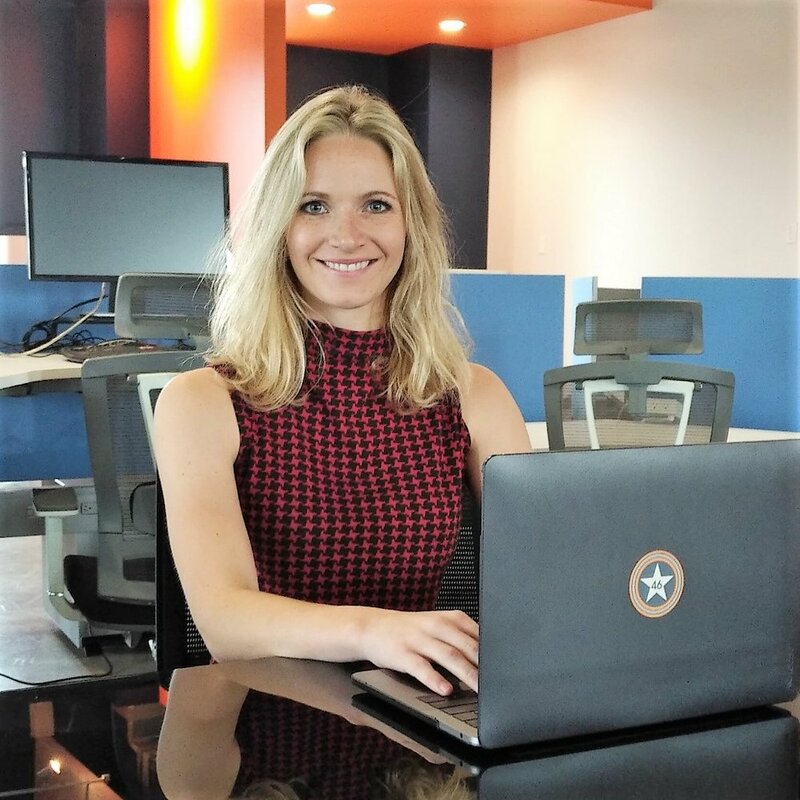 After moving to Stirling, Scotland to earn a BA in Journalism Studies, Viktoria began a journey that eventually led her to the coworking space here in Oklahoma City. “I moved to Glasgow in hopes of pursuing a career in communications. I applied for a job in media with the Commonwealth Games but ended up being recruited to work for their Events Operations team instead. It ended up being something I enjoyed far more than if I had succeeded in my original goal. After the Games, I ended up staying in Glasgow another couple of years working on other large-scale sporting and cultural events such as the World Bagpipe Championships and the BBC Proms in the Park, before eventually deciding to move to the States, where my mother is from. I’m not one of those lucky people who’ve known what they wanted to do since the age of 4 - the route so far is certainly a little haphazard and winding. Rather, I like to frequently assess whatever path I’m on for two criteria - Am I learning? Do I enjoy it? The worst thing I can imagine in any job, or for any areas of life for that matter, is stagnancy. If I’m challenged and enjoy the work, I like to believe the path will take me in the right direction. It seems to be working so far. But if it doesn’t...well at least I’m enjoying it. And isn’t that the point after all? In 2016, Viktoria began working for Cityscope, a company developing an Event Listing app for Oklahoma City. The company had offices at StarSpace46, one of the very first technology firms to become a member. As the Cityscope project was coming to an end, a chance meeting led to new opportunities. “I was at Will Rogers Airport waiting for a flight when I bumped into Jeff Yenzer, a StarSpace46 partner, and Hoegg Software’s HR Consultant. He asked if I was still looking for work, and if so, would I want to send my resume to Hoegg Software. Two weeks later I had an interview - and I was nervous. I had learned from their website that they did DevOps and IT Integration Consulting...but I still felt pretty clueless to what DevOps entailed, even after some research. What I did have was a huge interest in continuing working with tech and startups. My ten previous months at StarSpace46 had given me the taste of the startup working environment, and it was anything but stagnant. I was constantly learning, plus, I really enjoyed it. I got the job, and here I am a year later. And with a better knowledge of DevOps, too. Hoegg Software operates with a specific set of values. Their mission is to help all constituents become healthier, stronger, and safer through empirical decision making and transformative IT infrastructure. Viktoria approaches this objective passionately. “Hoegg Software’s goal is to make their clients software better. Ryan Hoegg describes software as a central nervous system keeping all the different ‘tribes’ of today’s society connected, and wants to see a world where humans and software live in symbiosis. By bettering today’s software, our mission is to equip our customers and their software to be healthier, stronger, and safer for such a future. Hoegg Software as it is today, quite frankly, would not exist without StarSpace46. It is fantastic being in a space where people are constantly helping each other out. You can find a whole array of different skill sets and levels of experience in the space, and many people volunteer their time and knowledge simply because business and innovation is their passion. Startups can come with their own unique sets of problems and I think it is very reassuring being around people who may have experienced what your company is going through before. In addition, StarSpace46 offers in-house fractional services such as bookkeeping and HR consulting, a huge benefit when a company is still in its growing phase and not ready to hire such services on a full-time basis.